A Golf Travel Bag Or Golf Travel Case? Well it had come time for another purchase. Sometimes I think I work to pay for golf. LOL. But seriously, I was kinda looking forward to this purchase because it is part of a vacation plan. I need a hard travel case for my golf clubs. Truth be told, we planned on flying and I would still like to fly to Florida but rates seem to be very high right now and with fees and sometimes carry on fees, my family might just drive to Florida. Yeah and now as I type this gas prices have gone up by 40 cents in the past week. Either way, I’ve decided that I need to protect my golf investment and get a golf travel bag, golf bag travel cover, or golf travel case for my clubs. So, I’ve done a bunch of research and thought that I would pass on what I’ve learned along the way. Before I say anything else, I wanted to make sure that what I purchased was going to be sturdy and up to the task. Meaning, I have a piece of luggage that is breaking apart at the seams from being tossed at the airport and another one where the zipper (well the zip part) broke from being placed face down instead of on its back. I didn’t think that I purchased cheap luggage but I did want to make sure that whatever I bought to protect my golf clubs would last more than a couple of flights or more likely trips in the trunk of my car with luggage. So if the golf travel bag, golf travel case, or golf bag travel cover ends up being $20 or $200, I just want it to last and I care less whether it is a brand name. Now right off the bat I should tell you that I should be partial to one particular golf travel case. 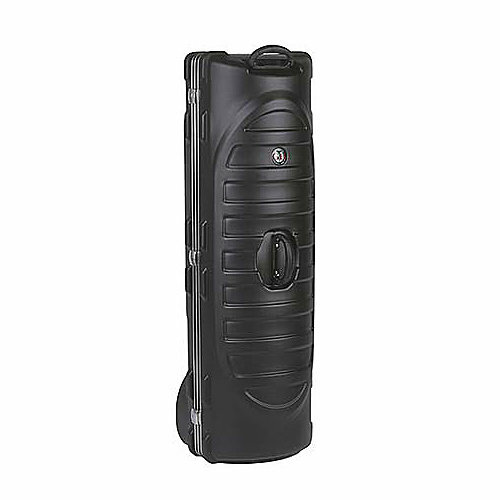 That is the Plano Golf Guard Standard Case. Reason being is that I have a house about 10 miles from Plano, IL and this case is made by a company that I am familiar with, Plano Molding. Being a golf travel case (hard case), my thinking is that it will protect the clubs better than a bag might and it could work either when flying or in a crowded trunk with a bunch of luggage. The Plano golf travel case has a bunch of reviews but to be perfectly honest, a couple folks talked about cheap latching mechanisms/clasps. The case itself seems sturdy enough but that is something to keep in mind. As you can see, there are rolling wheels and if you check out some of the reviews, this golf travel case is one in which others should be measured by. Of course having said that, it will set you back some $260 at the retail level, although I’ve seen the price as low as $190. Another golf travel case that I particularly like and it received very good reviews is what is called Golf Travel Bags The Vault. .
Again, this is what I call a golf travel case rather than a bag so don’t let the name fool you. It is made for oversized drivers (I have a TaylorMade Burner Superfast myself), has heavy duty locking latches, and the wheels are recessed behind the housing. In other words, this is a quality golf travel case. The locks are what I have been told “TSA Approved”. Now you may not think that your clubs will be tossed around but please listen to this one tip. You play golf and your clubs make it around on a fertilized course. Oftentimes the fertilizer itself will attach itself to your golf bag and clubs which in turn sets off alarms that the TSA will need to inspect your clubs. For a golf travel bag that comes with wheels, there aren’t too many more reasonably priced than the INTECH Golf Travel Cover with Wheels. It can be easily rolled through the airport. Just realize that this is a soft cover, so make sure to protect your clubs inside this golf travel bag in some other way. ie wrap your clubs in bubble wrap. For my purposes, the bag above would be perfectly fine for being in the car but I would feel that it may not be up to the task if it was manhandled at the airport. Hey, just being honest here. I like flying as much as the next guy but I don’t like to see things broken. When traveling long distances by car, I like the look of the following golf travel bag. It has a good look to it, comes in a few different colors and when found on sale, the price is right. It is called Golf Travel Bags Roadster 3.0. 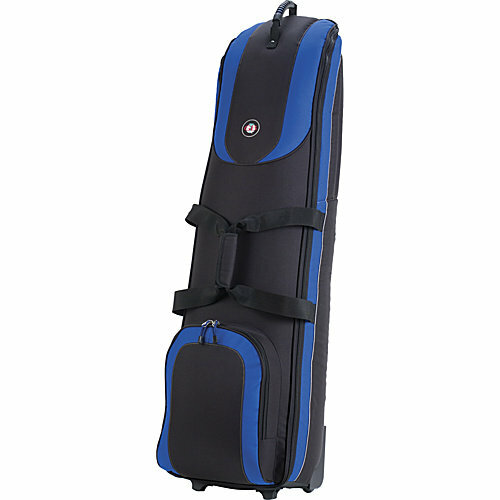 This golf travel bag rolls and has a nice padded top which can help to protect your club heads. There is also a pouch/compartment on the outside where you can put your golf shoes or other accessories. Finally, here is another golf travel bag cover which owners particularly like. It is called the CaddyDaddy Golf Constrictor Golf Travel Bag Cover. Again, it has wheels for rolling, you can purchase an optional TSA approved lock, and it is padded across the top to protect club heads. The material is strong and it will just fit your oversized clubs. This is a golf travel bag and not a case, so it will not have quite the protection that you will find with the cases. But then again look at the price and compare the Caddy Daddy Golf Co-Pilot and the Caddy Daddy Golf Constrictor at Amazon. So Was It A Golf Travel Case or Golf Travel Bag? Now I usually end a review by saying whether I like a particular product or not, pro’s and cons, and if I am looking at multiple products and I decide to purchase one, I’ll be sure to tell everyone which product I chose. Unfortunately I can’t do that at this very moment only because I have not decided whether we will be flying or driving on our upcoming vacation. If it were flying, I would definitely choose a golf travel case but in driving, I would be more than fine with one of the soft golf travel bags shown above. I’ll let you know which one I choose as we get closer to making that decision about our mode of travel.